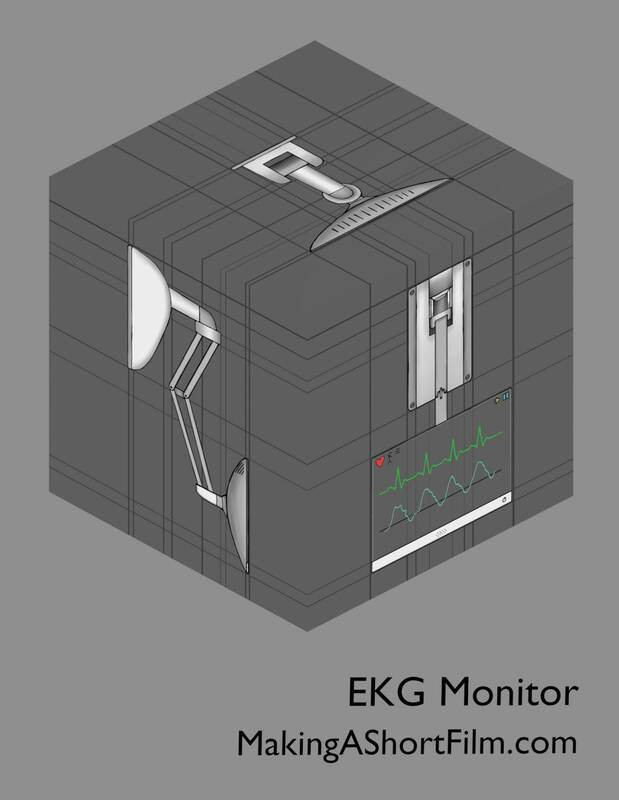 The design of the EKG monitor is now completed. You can see the result in the image up above. When it comes to the actual information displayed on screen, since I don't know anything about medicine in any way, I simply looked at images online to try a feeling for what these monitors usually display. I knew I wanted the EKG since that is a "symbol" most people are familiar with, and connect with heart and health. However, I also wanted something more displayed since it looked a bit too naked. So, I added another curve inspired by a curve on a real monitor I saw. I doesn't match a real curve, but, it is in the future so the curve can be "anything" really. All that concerns the audience is that it starts going haywire when the Old Man leans out of the bed. I have decided to not have any numbers or text on the display. I don't want people to read. I want the film to be completely image based. So, no beats per minute count, only the graph. I want it clean. The touch buttons would allow the user to change what is displayed easily, meaning not everything has to be shown at once. As for the design of the actual monitor and its hanging mechanism, I didn't refer to any existing EKG monitors, but instead focused on what I needed from it story-wise. The screen is attached up high on the wall to get a good swing when the Robot is mopping it. The arm is flexible to give it even more motion. I also added enough joints for it to be practical in reality, allowing you to rotate it and change its placement. However, the joint that allows the Robot to swing it would not be needed in reality, but I imagine it is him kind of breaking it when he makes it swing in that direction. As for the looks of it all, I wanted it to be a bit futuristic, but not too much. Therefor I made the screen kind of fat (which is something old/current), but with three out of four edges completely bezel free (which does not exist yet to my knowledge). It feels like a good level of high-tech, especially for hospital equipment which often looks pretty clunky (probably for durability) according to my limited Google research. The three views in the image are from the side, the front and the top. They all match each other fairly well, meaning I can work based on them when I model it later. Their compatibility can be illustrated by adding "height lines" like in my previous concept art, but on a cube instead to accommodate the three dimensions. Now the top view is placed on the top, and so on. Viewing this cube for a certain side should look the same as the finished 3D object later. 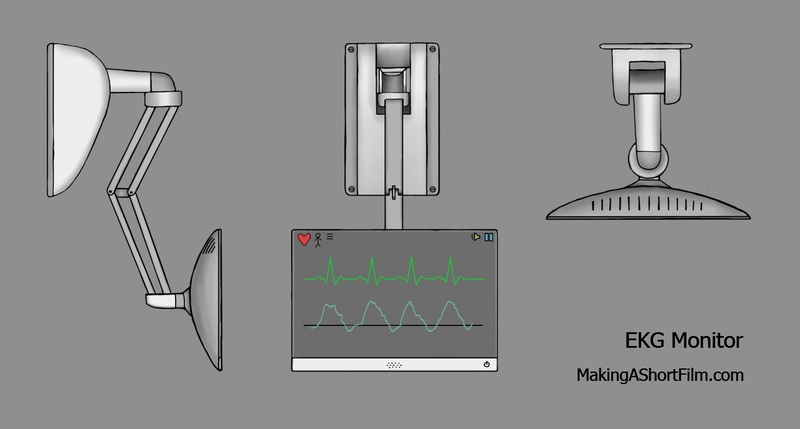 So, with the monitor done, I will move on to designing the hospital bed. See you next time!